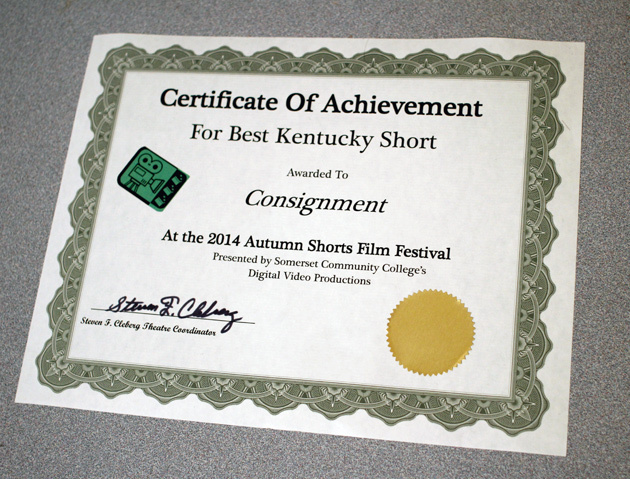 Justin Hannah's short film "Consignment" screened at the 2014 Autumn Shorts Film Festival on September 20, where it took home the award for Best Kentucky Short! The Autumn Shorts Film Festival took place September 15-20 in Somerset and London, Kentucky. The Festival screened 63 films from all over the world, hand-picked from over 900 submissions. This is the third award for "Consignment," which previously won Best Short Film at the 2013 World Independent Film Expo, and Most Original Film at the 2013 Floyd Film Festival.